Happy Easter, everyone. This morning I’ll be at church, where the choir is singing Beethoven’s “Hallelujah” from Christ on the Mount of Olives. I love the piece. Here’s Robert Shaw and the Atlanta Symphony orchestra, if you are interested. Last week I wrote of the loss of Morgan, our golden retriever. Now a week later, I’ll write of my experience at my first book signing and the release party we threw the weekend before her passing. I won’t bore you with how many books I did or didn’t sell. Although there are economic realities to the authoring business, these two events were mostly about having a good time. Jan and I arrived in St. Mary’s, GA on a beautiful Saturday afternoon in time for a leisurely lunch down by the river before our scheduled time at Ms. Wendy’s Wonderful World of Books. While there we had a great time talking with Wendy, her husband, friends and customers. We also got to meet my editor, who lives in the vicinity, and stopped by. The funniest moment came when someone told me I had a neat signature. Jan burst out laughing, and told the collective audience how I often couldn’t read my own handwriting a day or two later—which got us all talking about schools not teaching script anymore and how would people sign their names, with an X? Maybe everything would be iris scans...and off we went. The next day, we had the launch party at the clubhouse in our small condo community. It allowed neighbors to walk and Savannah friends to escape the St. Patrick’s Day madness (a half million people pour into our city of maybe 140,000) and join us in the ‘burbs. Jan ordered a cake with an edible frosting picture of the book cover. And a good time was had by all. But the best part came a few days later when a neighbor rang our doorbell to buy three more books for her friends because she had liked Bad Policy so much. And later in a conversation with one of our conservative neighbors who said they liked the book as well as Michael Connelly’s stuff; the only problem was that I had made the scummy politicians Republican. Or the email that blamed me for the person’s sleep deprivation because they couldn’t put the book down until well after midnight. Even if they are all lying, I’m going to choose to believe them and savor the moment. Wouldn’t you? Today's Salad Bowl Saturday blog by Sara Hoskinson Frommer was first published in 2012 on www.getitwriteblog.wordpress.com, the Perseverance Press authors’ blog. Since that time Sara has continued to use the Dragon voice recognition software she describes and now uses it full-time. I thought this was an interesting subject for all of our readers. Many years ago I heard Madeleine L’Engle say to a group of writers that the fingers are the only part of the body besides the brain with gray matter. That may not make sense to some people, but to me, a touch typist since my early teens, it made very good sense. When I’m writing I don’t think “I will spell ‘dog,’” but I just think “dog,” and my fingers know to type dog. The words come out of my fingers automatically. That’s not to say I don’t make mistakes — typos are part of every writer’s life. Why, you’re asking yourself, am I even telling you this? It’s because I’m trying something new. For the first time in my life, I’m trying dictation. My fingers are having trouble. I figure before they quit working altogether, I’m going to need to know another way to write. And I dearly hope to be able to do it as automatically as I now write with my fingers. So I’m learning Dragon NaturallySpeaking. In fact, I’m using it to write this blog. Dragon is a program that recognizes my voice and types into my computer what I say. It types exactly what I say. That’s not to say that it always gets what I mean. Dragon makes typos to. As you can see, it couldn’t tell the difference between to and too. For this blog, I didn’t correct that mistake. I wanted to show it to you instead. But most of the time I’ve had to learn commands that will let me fix things that are wrong, whether the mistakes are mine or Dragon’s. Of course, many of the changes I make are not to correct mistakes. When I’m writing, I’m constantly revising. As far as I’m concerned, revision is at the heart of good writing. Many years ago, if I wasn’t typing, I used to write on a yellow lined tablet. I quickly learned to write on every third line, if you can believe that, to make space for all the changes that I knew would come. Computers make revising much easier. But this is a whole new way to use a computer. People told me that there was a steep learning curve to using this kind of software, and I believed it. But already, after a few weeks, I’m doing better, and so is Dragon. More and more often, it recognizes the words I’m actually saying. The hard part so far is learning how to make corrections and other changes. I almost have to sit on my fingers to keep from fixing things with them instead of practicing with Dragon. None of that is what I worried about at first. What worried me was whether I could stand to hear my voice when I’m writing. Writing for me has always been a private activity. Oh, I can write some kinds of things in a crowded room with people kibitzing. Right now, though, I feel hesitant even to write this blog with my husband listening from the next room. Or maybe not listening, but he could if he wanted to. I’m not sure I can write fiction that way. If I’m typing a story, I don’t like someone to stand behind me. Dictating feels like that, only more so. I’m basically shy when I’m writing. I do a huge amount of editing before I submit anything. What I usually type in the first place is very drafty. When I’m feeling drafty, I cover up. So I hide all by myself and write in private, not letting even myself hear what I’m saying. It isn’t the same listening to me talk as it is to listen to my characters talk. I still haven’t quite figured out why, aside from the obvious fact that I can’t begin to sound like Fred Lundquist or any other man. When I read a book, whether it’s a book I wrote or a book someone else wrote, I hear the people talking inside my head, and they don’t sound like me. This is the part about dictating fiction that terrifies me. So far, just struggling with the mechanics, I can’t answer that big question. I’m still fussing with some things. For instance, if my characters speak colloquially, I want to spell the words the way they say them. I don’t want to write “You going out?” if my character would say “You goin’ out?” I fought with the program for several days before I found out how to put an apostrophe at the end of a word. And you know, I don’t remember how I did it. But now if I pronounce going without the G, the program still spells it going, but I have the option in the correction place to spell it goin’. I think I had to put that into the program myself, and I’ll probably have to do the same thing with other such words. At least it’s possible. One of the inconveniences to using Dragon is that you need to be in a fairly quiet room. For me that means that I can't listen to classical music or jazz while I'm writing. If I turn the volume way down I can sometimes get away with it. But if someone else is speaking, those words may end up in what I'm writing. It's not that I mind being alone when I'm writing – I rather like that. Any minute now, though, I'm going to be interrupted by someone who likes to talk while she works in my room. Either I'll have to quit writing or tell her to quit talking. That can be awkward. Still, voice recognition software can be kind of fun. The other day two young friends were visiting, and one of them knew I was trying it. “Do you have that new program set up yet?” she asked. I told her I did, and she was eager to try it out. 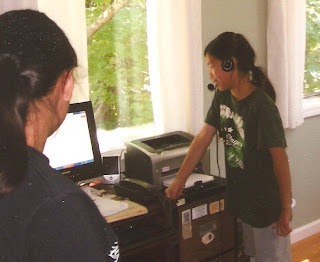 So we all traipsed into my room, and the children took turns wearing the headset and talking into the microphone. There was considerable hilarity when they read what Dragon thought they were saying. Of course, by that time I had trained the program to recognize my speech pretty well. You first do that by reading selected texts into the microphone, so that Dragon can hear you pronounce what it already knows. But the program had no idea how these girls pronounced things. The resulting gobbledygook cracked them up. They were talking into my computer, but when I read today what the computer had stored, I couldn’t remember what they’d said in the first place. What I do remember is that when I laughed, Dragon typed it it it it it. Another time I accompanied my sister to the foot doctor. Just making conversation while he trimmed her toenails, we got to talking about writing. And so I mentioned that I was using voice recognition software. To my surprise, the foot doctor said he was, too. In fact, he was using Dragon to dictate case notes. He told me he thought he and his partner had taught Dragon all kinds of new words. I figured he meant technical words, medical words about feet, but no, he said, he meant the words they used when Dragon got their dictation wrong. Oh. Somehow I think Dragon already knows those words. Don McNair’s extensive experience as an editor and author show up in his clear, readable book on how to avoid foggy writing. This is the most complete writing book I have ever read. Mc Nair takes his reader from the first sentence of his or her work in progress to submitting the polished work to a publisher or an agent. 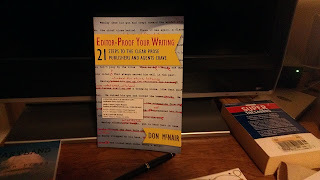 Editor-Proof Your Writing starts from the premise that to be able to fix problems in your writing, an author first needs to know what the problems are. McNair has developed a systematic approach an author can follow to discover and correct the type of errors that doom an otherwise well-written submission to the rejection pile. His book is organized into progressive chapters with exercises to help readers understand the concepts. Readers also are encouraged to apply the knowledge learned to their own work in progress so the WIP improves steadily as the reader works through the chapters. McNair covers important mistakes culled from his many years as an editor. His writing is clear and easy to follow. Although he focuses on errors, he is not critical. He encourages his readers, noting that writing skills can be improved with attention and practice. His advice to weed out the word “had,” touched on one of my personal bad habits. Had I known this technique earlier in my career I would have had less editing to do. I think his book would be especially useful for authors who have completed a work in progress and who wonder what the next step should be. In a few days it will be Easter, a holiday filled with joy for the religious meaning, because it’s finally spring, and for youngsters, who look forward to the Easter Bunny and candy. For my family it means getting together for dinner after church. There’s always a ham, colored eggs, sweet potatoes, and dishes and desserts others contribute. This year it will be at my house. When my grand kids, nieces and nephews were younger, I made up an Easter egg hunt with teams, who had to look for plastic eggs with clues in them. There would be the purple and pink team, the green and yellow team, and the orange and blue team. Each team was given an egg in their colors with the first clue leading them to the egg with the next clue. The clues were riddles leading them all over my small farm – the hay mow, an old unused outhouse, in the reeds by the pond, and on and on until the winning team found a basket of candy hiding in the house – maybe in my clothes dryer. Teams with tiny participants unable to read were allowed to have adults help them. It took me a long time to write the riddles and distribute them the day before Easter, but the kids – and adults who participated – loved it. Now they’re all too old for that. This year it is the 60th anniversary of Peeps, those little yellow sugary confections considered “THE candy of Easter.” Not for me, though. I much prefer chocolate; rabbits, eggs, chickens, anything chocolate to those marshmallow type chicks. Peeps are made at Just Born factory in Bethlehem, Pa., and they hatch 5 million Peeps a day this time of the year. Not only do they appear in most Easter baskets, it seems they have developed a Peeps pop art culture with people making dioramas with them and other types of Peep art. Some people even use them in cooking, even in not to be believed dishes like sushi. According to Ross Born, the third-generation operator of Just Born, Inc., It’s the “Peepsonality” of consumers who not only eat them, but also play around with them. At my Third Thursday book club, I took in the Peeps I didn't use for my pictures. There was a lively discussion on whether or not they liked Peeps. Linda Bailey liked them, but only if they were stale and rather hard. Some remembered roasting them like marshmallows over a fire. Maybe I'd like them if they were roasted, but I won't find out because there were no Peeps left when the book club was over. 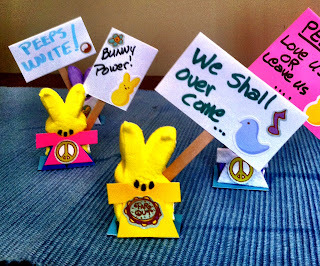 Carla Damron thinks Peeps are evil. She says "They are a demonic plot. Notice how they have infiltrated every holiday. Soon, I believe they may take over the world!!" To prove her point she sent me several pictures she considered harassment by her friends because of her antipathy for Peeps. Last year when she came to her office, she found it taken over by 'Occu-peep Columbia.' Peeps were everywhere in various poses and costumes. She sent me several pictures of this occupation. So I think she may be right. She also told me one year her husband gave her Peeps and a hammer. She claims even a hammer won't destroy the little buggers. Hmmm. So that got me to thinking. Maybe I’ll decorate the top of my sweet potato casserole on Easter with them. Or better yet, maybe I’ll just plot a murder with them – only on the page, of course. Poison could be injected in them. Of course, one would have to make sure only the one it was intended for would eat the Peep. That means there could not be any kids around. That’s easy enough for a writer to do. Kaye George in her book CHOKE had a victim choked with a sausage. It could be done with Peeps, too, I imagine. But for now, I’ll put all thoughts of murder aside to concentrate on the beauty and joy of Easter and its true meaning, and just how I’m ever going to get my house in order before everyone arrives for Easter dinner. Besides eating Peeps in their natural state, how would you eat them? Or what kind of art would you make from them? Tangled and unidentifiable computer wires strangling your creativity? Are sticky notes covering the surface of your computer, obscuring the screen? Too many characters populating your novel? With the official start of spring, I’ve been gearing up for the ritual of spring cleaning. Buds on the trees and tulip shoots poking through the ground prod me to clear the way for new growth in my writing life. In order to do this, I need to prune both physical and emotional clutter surrounding my writing. * Sort through books and magazines. Keep my favorites and the most useful how to write books. Donate the rest to the local library for their monthly sale. * Collect sticky notes, scraps of paper and paper napkins filled with my scribblings about characters and stories then transfer this treasure trove to my PC. Make sure I grab the ones that say things like, “What is the fastest acting poison?” before my neighbors visit. * Double check that my computer backup is working so I don’t lose files like last year. * Paint the wall in my writing area a honey yellow color. Currently, it’s beige and boring. Snoooooze. * Change the passwords to access my email and social media accounts. * Make sure the files I need the most are within easy reach. Toss unnecessary papers. * Take some time to think about the following questions: What do I need to change in order to gain more time to write? Do I have any negative thoughts or beliefs about writing that are holding me back? What social media sites are working for me and which ones can I delete? Do I need a website? Are the writing groups I belong to useful for what I write? 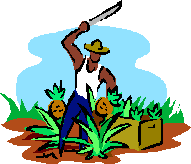 * Grab a machete and prune characters in my WIP. Perhaps there are a few insignificant characters that would be better off combined into one character. *Take a Spring Break. I plan to read something just for fun like WRITERS GONE WILD: The Feuds, Frolics, and Follies of Literature's Great Adventurers, Drunkards, Lovers, Iconoclasts, and Misanthropes by Bill Peschel. Are you giving away, reorganizing or reassessing something in your writing life this spring?